NYU Medical Center suffered significant damage when Sandy hit the tri-state in late October, and within two months, the privately owned hospital received $150 million in FEMA aid. Today, with the help of taxpayer dollars, the hospital is almost fully operational. Political leaders have praised the swift infusion of cash, but some victims of the storm say it exposes a gaping inequity in the way FEMA handles federal disaster grants. Individuals with flooded homes cannot get FEMA disaster grants until all of their private insurance claims have been settled, but that same rule does not apply to large institutions like NYU Medical Center, even though they have private insurance contracts in the hundreds of millions of dollars. “I can’t get that money, because I have a flood policy and I did the right thing by paying my premiums,” said Jeff Greenberg, an East Rockaway storm victim whose home was destroyed by Sandy. NYU declined to answer questions about the size of its private insurance contracts, but in bond disclosures uncovered by the I-Team, NYU executives said the hospital has “an all-risk property policy” that covers buildings and contents at replacement cost value. It’s not clear if that “all-risk” policy includes damage caused by floods. Bill Connolly, who writes insurance policies for hospitals in New Jersey said prestigious teaching institutions like NYU Medical Center would likely be well insured against floods. “I would be surprised in NYU Medical Center didn’t have very good insurance,” said Connolly. 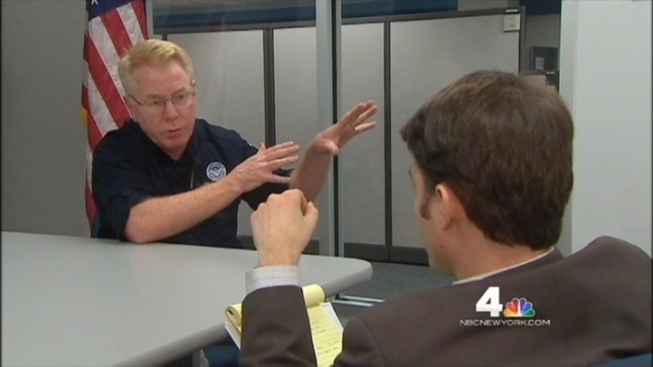 In an interview with the I-Team, Michael Byrne, FEMA’s top coordinator in New York, said he did not know if NYU had flood insurance. Byrne did stress that FEMA insurance experts closely examine disaster aid applications to make sure the federal government does not reimburse for damage already covered under private insurance contracts. FEMA declined to share NYU’s application for federal disaster aid. According to the hospital’s most recent financial statements, NYU Medical Center had more than $200 million in untapped credit lines before Sandy struck. As a matter of policy, FEMA does not consider an institution’s ability to pay for damage on its own when awarding disaster grants. In days following Sandy, NYU Medical Center CEO Dr. Robert Grossman acknowledged that the hospital had insurance coverage, but did not explain the extent of that coverage. Sen. Charles Schumer said in a November news conference, "Even a huge and prosperous hospital like NYU cannot, cannot do this on its own." Questions about insurance aside, some critics have taken aim at FEMA for not prioritizing publicly owned hospitals over NYU, which is a private nonprofit institution. As of January, Bellevue Hospital, owned by New York City, had received just a fraction of the FEMA aid given to NYU. Schumer’s office announced on Jan. 18 that a $103 million FEMA grant would be split between four publicly-owned medical facilities: Bellevue Hospital, Coney Island Hospital, Coler-Goldwater Hospital, and Metropolitan Hospital. It was more than a month earlier, on Dec. 16, that Schumer announced the $150 million disaster grant solely for NYU. "I have questions about [NYU Medical Center] getting federal dollars for this purpose but also for them to be the first is very disturbing," said Judy Wessler, executive director of the Commission on the Public’s Health System, an advocacy group that pushes for more treatment of poor and uninsured patients. Wessler believes the $150 million FEMA grant would have been better spent at Bellevue where, she says, doctors treat 17 times more uninsured patients than NYU. As of the end of January, Bellevue Hospital was still unable to accept inpatients and remained without functional operating rooms. Bellevue’s emergency room was also unable to treat critically injured patients, although the city has opened an “urgent care center” that is accepting non-critical ambulance patients. NYU Medical Center’s emergency room also remained closed, but the hospital is mostly open for inpatient and surgical services. Byrne said the only reason NYU received disaster grants before city-owned hospitals was because NYU completed its application sooner. He stressed the current disaster aid totals represent just the first round of federal aid and both NYU and city-owned hospitals can expect more cash in the coming months. “To be fair to everybody, we treat everybody the same,” Byrne said. Nicole Gelinas, a conservative economics writer for the Manhattan Institute, argues FEMA should not treat all applicants the same. Gelinas points out that NYU Medical Center has a wealthy donor network and the ability to borrow hundreds of millions of dollars on the private market. Public hospitals are often less able to raise capital quickly. "Money that you give to a private hospital institution is money that you're not giving to public schools, to public hospitals, to other public institutions,” said Gelinas. “You really have to ask, is it the best use of the funding?"